The British rules left India and in became Independent on the 15thaugust , 1947. Like other countries the free people of India wished to make their own constitution. A constituent assembly was formed. It took two years, eleven months and eighteen days to make a constitution for India. The new constitution of India came into force on the 26th January 1950. As such India became a sovereign democratic republic. Since then 26thJanuary is celebrated as the Republic day. It means a state having a government of the people, by the people and for the people. 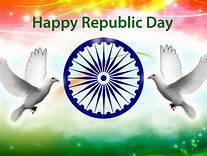 The Republic day has become a national festival of our country. There is much pomp and grandeur on this day. Delhi hums with life. A foreign dignitary is invited as the chief guest of the celebration. The President of India unfurls the national flag with the national anthem. Bands are played with tuneful music. A thirty-one gun salute booms us the President goes up the Red fort. The helicopters shower flowers from the air. The President takes salute, ceremonial parades are held by the people, three wings of the difence force. N.C.C. scouts and students of the schools and colleges is colorful dressers. The president delivers an inspiring speech for all. People rally round to witness the garden show of tanks, armored cars and weapons. In the state capitals, the Governor of the state concerned unfurls the national flag and take salute in a grand ceremony. In the district headquarters the state ministers receive salute and hoist the national flags. All the governments officers, educational institutions remain closed on this day. In schools and colleges various competitions are held among the students to inspire them to develop love for the country. India is the biggest Republic in the world. We should observe this day with all sincerity. It will remind us our sacred duty to guard are constitution. It is said that “internal vigilance is the price of liberty”. If we don’t vigilant of our constitution we may lose freedom.